Considering that plastic swimming pools await them outside, the children sitting on the floor at the Lake Austin Montessori School are well-behaved. For now, the 2-to-5-year-olds are paying attention to the man in the blue baseball cap who is strumming the guitar and singing in a gentle but solid voice about ``Tom the Teddy Bear who's flying in his favorite chair.'' At the chorus, 40 pairs of little arms flap as the children fly along with Tom. The kids call him the Music Man. 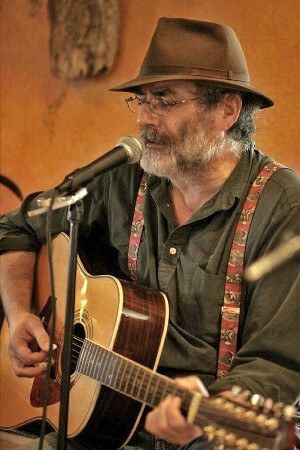 Jon Emery, 51, has been playing music in Austin for 22 years, from rock to country and, now, children's songs. Like many local musicians, big-time success has eluded Emery. Instead of headlining arena tours, he has found a living playing at day-care centers and retirement homes. ``I've played the entire age range from 0 to 100, from infants in their cribs to a woman at her 101st birthday party,'' Emery says. And though he's not a rock star, that's just fine with him. He says he's tickled by any praise, especially from his youngest fans. ``Parents come up to me and tell me, 'My son has a little guitar and he plays it and pretends he's you.' That just flabbergasts me,'' he says. Emery became drawn to music in the same way. Growing up in small towns in Vermont, he remembers how as a 4-year-old he was mesmerized by the sounds that would fill his grandparents' attic where his 11-year-old Uncle Bob practiced guitar. For most of his life, Emery played in bars and clubs. It was just six years ago when he started calling day-care centers and schools and discovered that few of them ever offered live music. Suddenly he found himself in a reverse situation; he was in demand. ``Instead of too many musicians and not enough venues, I find it's the opposite in playing children's places. . . There are so many places that I can't play them all,'' says Emery, the father of a 9-year-old boy. ``It just amazed me how easy it was to get hired. I had been scrambling for years, trying to figure out how to make a living playing music, especially in a town like Austin where there are musicians crawling out of the woodwork . . . One in three day cares would hire me, sometimes even without hearing me play first." Of the dozen albums Emery has recorded, three of them are children's albums, including a 1997 collection of his own children's songs on tape, ``Here Comes the Music Man.'' Emery estimates that he played 800 shows last year; the majority children's gigs. He plays between three and seven places a day on a regular schedule, returning to the same place once a month, or every other month. Earning approximately $50 an hour, Emery says he is making good money, but tries not to play too much for fear of burning out. At a club or bar, he usually earns $20 or $30 for the night. Emery, a Vietnam veteran who established his music career in Omaha, Neb., where he was stationed, moved to Austin in 1976 at the suggestion of former high school bandmate Leroy Preston. At the time, Preston was a singer for Asleep at the Wheel. Emery started several bands; some opened for acts such as George Strait and Alabama. Seventeen years ago, bassist Art Blondin, drummer C.T. Bedner and Emery formed the Jon Emery Band, which is still together today. In 1985, the band put out their first album, ``Hillbilly Rock 'n Roll,'' which is how Emery describes his music. But duplicating the packed rooms he played to in Omaha was tough in the competitive Austin music scene. While he was working a series of day jobs in 1991, his ex-wife brought him a copy of Robert Louis Stevenson's ``A Child's Garden of Verses.'' Emery set 58 of the poems to music, recorded them in a two-volume casette set and decided to try playing to a new audience. With a smile that reveals a gap between his two front teeth and a face engulfed by large-framed plastic glasses, Emery at first seems an unlikely performer. But once he starts playing, it's obvious he's comfortable on the stage. At the Saxon Pub, Emery surprises with witty lyrics. Twice-divorced, his sense of humor about relationships polishes many songs from this year's CD ``Two Separate Highways." ``I want to finish watching the game, you want to watch Melrose Place,'' he croons in ``One Compromise Too Many.'' ``We compromise -- Melrose Place." At the Lake Austin Montessori School, 718 Hearn St., he also springs funny lyrics, but with different subject matter. Playing ``Itsy Bitsy Spider'' he begins the second verse with a variation, ``Big Daddy Spider is climbing up the water spout,'' and continues through an imaginary spider family, ending with a wavering falsetto about ``Baby Bitsy Spider.'' The sing-a-long has turned into a room of screaming laughter. Penny Martin, principal of Lake Austin Montessori School where Emery performs the third Thursday of each month, regards the Music Man as a permanent fixture at the school. ``I think it's important for children at this age to be exposed to music and to learn how to be an audience,'' she says. ``(Emery) really puts things at (the children's) level and puts a lot of himself into what he does. He uses nursery rhymes and sings in different voices, things that really engage the children and get them involved with music." Clapping along to a song is more than just fun for children. Seeing a musician perform builds a foundation for later music education. ``Exposure is the first step of musical learning; it's an internalizing process,'' says Warren Henry, chair of music education at the University of North Texas. ``Learning music is much like language acquisition in that when babies are born they don't know how to speak but learn by listening. Music is the same way in that children need to be exposed to music without expectation of an immediate response. With this gentleman in the classroom, it's obviously a very positive experience for the kids; that in itself is a powerful message, that music is something enjoyed by everyone. It gives them the potential to succeed as musicians later on in life." Exposure to music at a young age may also teach children basic concepts such as counting and time, though Henry says that studies on this subject are not conclusive. Emery has learned a few things about performing though. ``I've learned that I need to stay focused,'' he says. ``I play the same songs over; it's hard not to let my mind wander. But I really have to pay attention. If I don't, they won't. And that spills over into my shows with the band. But the bottom line is 'Let's have fun.'" While he has enjoyed playing to children, Emery would like to see the Jon Emery Band do better and also wants to put together a 10-piece band, complete with a horn section. He hopes for success, but he's happy just to get paid for what he loves doing. ``It never occurred to me to do anything else,'' he says. At the day care, after the guitar is put away and as the children file out to get snow cones, several linger around him and give him hugs. ``That's the best part, hugging the children; it's better than playing the music,'' Emery says.